I live near port of Baltimore and looked forward to not having to fly somewhere. I was interested in the ports being visited. I knew the ship was smaller than what I was used to but didn&apos;t think it was as old as it was. This was first cruise on Royal Caribbean. I&apos;ve cruised Celebrity, Princess and Carnival. It was my 11th cruise. I was a bit shocked how outdated the cruise ship was especially with inability to check account on tv. I had a Jr suite which should be called Balcony Plus, because it was a little bigger but didn&apos;t even offer a bottle of water as a perk for the more expensive cabin. And I was for some reason, unaware that there would be a POLE in my cabin at bottom of my bed !! Maybe it was in small print. I booked cabin on internet right under the spa....bad move. Water runs through pipe. The middle of night they clean spa and move furniture around...woke me up every night. We had 5 ports to visit....we had 7...SEVEN...cruise excursions cancelled !!! Yep, they offer soooo many excursions and it&apos;s a small ship so they said about 2/3 of them get cancelled. DUH !!!! The same excursions are offered to their ships that hold 2 and 3 times as many people. Therefore cut down the list for smaller ships and maybe, just maybe you won&apos;t be rescheduling&cancelling over&over. I felt sorry for Shore Excursion staff. In the dining area.....no real complaints about food, but about the specialty people bugging us with their menus and not getting the hint to stop interrupting us while having a nice time with our newfound friends was a problem. The prices are outrageous for the specialty restaurants and if not getting enough people then lower the doggone prices. It&apos;s a good thing that my main reason for cruising is to enjoy the view of the sea and it&apos;s very relaxing on balcony doing just that. The entertainment was pretty good and won a little in casino which helped me afford bottles of wine for dinners. Cannot understand why an $8 bottle of wine has to cost $35....4 times more. It was a 12day cruise so the 2 bottles we brought onboard only lasted a few days. All the staff in all the areas were very nice, pleasant people. No complaints there. But doubt I will be looking toward Royal Caribbean for next cruise. That POLE by my bed got run into a few times...glad it was padded. I will certainly do more research before booking my next cruise. I live near port of Baltimore and looked forward to not having to fly somewhere. I was interested in the ports being visited. I knew the ship was smaller than what I was used to but didn&apos;t think it was as old as it was. This was first cruise on Royal Caribbean. I&apos;ve cruised Celebrity, Princess and Carnival. It was my 11th cruise. I was a bit shocked how outdated the cruise ship was especially with inability to check account on tv. I had a Jr suite which should be called Balcony Plus, because it was a little bigger but didn&apos;t even offer a bottle of water as a perk for the more expensive cabin. 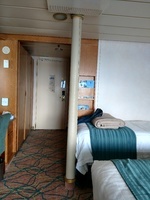 And I was for some reason, unaware that there would be a POLE in my cabin at bottom of my bed !! Maybe it was in small print. I booked cabin on internet right under the spa....bad move. Water runs through pipe. The middle of night they clean spa and move furniture around...woke me up every night. We had 5 ports to visit....we had 7...SEVEN...cruise excursions cancelled !!! Yep, they offer soooo many excursions and it&apos;s a small ship so they said about 2/3 of them get cancelled. DUH !!!! The same excursions are offered to their ships that hold 2 and 3 times as many people. Therefore cut down the list for smaller ships and maybe, just maybe you won&apos;t be rescheduling&cancelling over&over. I felt sorry for Shore Excursion staff. In the dining area.....no real complaints about food, but about the specialty people bugging us with their menus and not getting the hint to stop interrupting us while having a nice time with our newfound friends was a problem. The prices are outrageous for the specialty restaurants and if not getting enough people then lower the doggone prices. It&apos;s a good thing that my main reason for cruising is to enjoy the view of the sea and it&apos;s very relaxing on balcony doing just that. The entertainment was pretty good and won a little in casino which helped me afford bottles of wine for dinners. Cannot understand why an $8 bottle of wine has to cost $35....4 times more. It was a 12day cruise so the 2 bottles we brought onboard only lasted a few days. All the staff in all the areas were very nice, pleasant people. No complaints there. But doubt I will be looking toward Royal Caribbean for next cruise. That POLE by my bed got run into a few times...glad it was padded. I will certainly do more research before booking my next cruise. See above...not too great. I tried to put picture of room with POLE by the bed but it wouldn&apos;t go to my computer to add and I was unable to drag.